Missed Part One? That’s okay, you can read it HERE and then come back. Life continued to take dramatic turns for Margot after she wed Henry of Navarre. Though she saved his life during the St. Bartholomew’s Day Massacre, she did not care for his Huguenot religion. Marguerite’s three surviving brothers, King Charles IX, Henry, and Francis (originally named Hercule Francis) used Margot in their various plots. One such plot was formed in 1573 when Charles IX was declining. The heir presumptive, Margot’s brother Henry, was away in Poland as he had been elected king there. A pro-Protestant party formed around Margot’s brother Francis. The goal of the party was to put Francis on the throne because he was religiously tolerant. Margot’s brother Henry was Catholic. Margot’s husband Henri was part of the plot, though Margot was originally against it. Eventually, Margot decided to join her husband Henri and her brother Francis. The plot was discovered in April 1574, a few weeks before Charles IX died. Henri and Francis were captured and imprisoned in Paris. Margot, ever the faithful wife, provided Henri with advice while he was imprisoned. Fearing trial and knowing his wife was clever, Henri asked her to help him put together his testimony. Henri was acquitted when Margot’s brother Henry became Henry III of France on 30 May 1574. Henry III did not let either Francis, Henri, or Margot free, though they were allowed to move about the French court. Francis escaped Henry III in 1575, and Henri slipped out in 1576. Margot had no idea that Henri was planning to escape, and he effectively abandoned Margot to her brother Henry III. Margot stayed on in Paris until 1577, when she asked to visit the Belgian city of Spa to take in the waters. Really, it was a diplomatic trip to glean from whom Francis could expect support. Margot was gone for about two months. Margot’s brother Francis had turned his eyes toward Flanders by 1577. Rebellion against Spain left the people of Flanders wanting a new leader. She wished to help her younger brother Francis with his campaign in the Netherlands. The Flemish were rebelling against Spanish rule. Margot was gone for about two months. Margot met with several anti-Spanish nobles during her roundabout trip to and from Spa, including Don Juan of Austria. Don Juan, was acting Regent of the Netherlands and illegitimate son of the deceased Holy Roman Emperor Charles V. Though he was kind to Margot at the beginning of her tour, he later tried to capture her. Margot was fabulously received at cities critical of Spain. However, Don Juan and his troops posed a serious threat on Margot’s return trip to France. Don Juan caught up with Margot and almost completely encircled the city in which she and her court were lodging. The Queen of Navarre was only able to escape because of the kindness of the citizens. They provided a distraction for Don Juan, then ferried Margot and her court across the river to France before Don Juan figured out what was happening. Margot had taken another reported lover by 1578. Margot was not always supportive of, or faithful to, her husband. Though she tried to protect Henri from the meddling of her mother Catherine de’Medici or her brother Henry, Henri did not return Margot’s affections. She would have at least four or five throughout her lifetime, not unlike Henri. This particular lover conspired with Francis against Henry III, who again imprisoned Margot in her rooms at the Louvre. Francis was imprisoned within the Louvre, too, and the lover in the Bastille. Francis later escaped via a rope thrown out of Margot’s window. After this escapade, Henri of Navarre decided he should probably have his Queen of Navarre at his court. Henri and Margot asked Henry III to send Margot to Navarre. Henry III consented. Catherine de’ Medici accompanied Margot to the Navarre court in Nérac, with the Queen Mother of France and Queen of Navarre stopping at various cities along the way in an attempt to soothe still-simmering tensions between Catholics and Huguenots. The couple was unable to conceive a child together within the first few years of their marriage, despite trying. Henri’s attention turned to various attractive young ladies at court. This included Charlotte de Sauve, a member of the French court that was cultivated by Margot’s own mother. Charlotte was invariably a lover of Margot’s brother Francis and her husband Henri. Even worse, both men flirted and cavorted with Charlotte openly. This led to feuding between the two men in the wake of Henry III taking the French throne. Another humiliating experience in Margot’s life involved a 14-year-old girl named Françoise de Montmorency-Fosseux. She was nicknamed “La Belle Foussese,” or The Pretty Foussese. While in the employ of Margot, Foussese became pregnant from Henri. Margot discovered the pregnancy and asked Henri to banish Foussese from court. Foussese made a scene and Henri refused to banish her. Henri also chose not to speak to Margot for the rest of the pregnancy. Finally, the day came for Foussese to give birth. Margot assisted in the difficult delivery, and perhaps in a stroke of poetic justice, Foussese was sadly delivered of a stillborn girl. It was approximately 1582, and Margot was about 29 years old. Fed up with Henri’s boorish behavior and Protestantism, Margot left Henri in 1585. She attempted to rally the Catholic forces against him. She seized the city of Agen, in the Aquitaine, and assaulted cities in the surrounding area. She augmented Agen’s fortifications, she beat a hasty retreat after royal forces bore down on the city. Margot went to the fortress of Carlat, but abandoned it about a year later for her castle at Ibois. She was again attacked by royal troops and captured. Henry III decided to imprison Margot at the castle of Usson, where she lived for nineteen years until 1605. While at Usson, Margot created an intellectually glittering court. She invited musicians there, too. Margot restored the castle and studied relentlessly to pass the time. She also kept up correspondence with Brantôme, who would go on to be a bit of a biographer. He encouraged Margot to right her memoirs during the time she spent at Usson to counter negative rumors about her. There was a third mistress of Henri’s who caused great disruption to Margot: Gabrielle d’Estrées. She became Henri’s mistress in 1590, when she was about 17 years old. Henri had just become King of France in 1589 after Margot’s brother Henry III was assassinated. 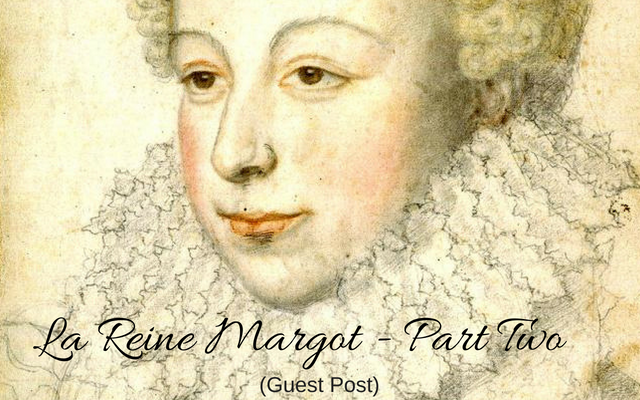 As his wife, Margot became Queen of France. Henry III did not have any children. Gabrielle was similar to Margot in that Gabrielle was very intelligent, proved she could handle for or assist with diplomatic matters for Henri, and she was a Catholic. Gabrielle gave birth to Henri’s first son in 1594, when Margot was 41. For a time, Gabrielle tried to persuade Henri to install her as queen and legitimize their son, César. Henri approached Margot in 1593 about annulling their marriage. Margot was sensible and knew that because of her sterility, continuing with their marriage would only endanger Henri’s hold on the throne. And at this point, Henri had returned to the Catholic fold at the urging of Gabrielle. In 1595, he legitimized his son César. At that point, Margot was no longer willing to negotiate for an annulment. In March 1599, Henri made the bold move of giving Gabrielle his coronation ring as a token of his affection. She was pregnant again. On 9 April 1599, Gabrielle suffered from eclampsia-related complications. She gave birth to a stillborn son and died on 10 April. Henri gave his mistress a funeral worthy of a queen. The death of Gabrielle d’Estrees opened the door for Margot to make demands on Henri for him to more swiftly procure their annulment. She wanted permission to use her royal title, and significant monetary compensation. The cancellation bull was pronounced by Pope Clement VIII on 24 October 1599, and the annulment pronounced in December. Henri married Maria de’ Medici in October 1600, but the groom was not present at the lavish wedding ceremony in Italy. Henri was 47, Maria was 25, and Margot was 47. Margot eventually returned to Paris in 1605. She settled on the Seine and there built l’Hostel de la Reine Marguerite, which survives now only through a 1615 city plan of Paris. Maria and Margot grew close over Henri’s continued lascivious behavior and open cavorting with mistresses. Maria had six children with Henri, including Louis XIII of France and Henrietta Maria, Queen Consort to Charles I of England. Margot took joy in Maria and Henri’s children, often nurturing them. Margot passed away on 27 March 1615 in her Hostel. She was the very last member of the Valois dynasty. About thirteen years later, Margot’s memoirs written during her time at Usson were published. Her memoirs provide great incite into not only this woman’s life, but what France was like during the late 16th century. Still available today, her memoirs have been read by countless people seeking to learn more about the last Valois. Goldstone, Nancy. The Rival Queens: Catherine de’ Medici, her Daughter Marguerite de Valois, and the Betrayal that Ignited a Kingdom. New York: Back Bay Books (2015). Baumgartner, Frederic J. France in the Sixteenth Century. London: Macmillan (1995). De Valois, Marguerite. Memoirs of Marguerite de Valois, Written by Herself. New York: Merrill & Baker (1800). The Editors of the Encyclopædia Britannica. Pierre de Brantôme. 18 November 2009. https://www.britannica.com/biography/Pierre-de-Brantome Accessed 31 May 2018. The Editors of the Encyclopædia Britannica. Marie de Médicis. 29 June 2018. https://www.britannica.com/biography/Marie-de-Medicis Accessed 1 July 2018.